Whatever you do in the next six weeks, don't spend any money on iPhone accessories. No matter how enticing the sales are, no matter how frayed your case is. There are significant changes coming to Apple's marquee handset—and soon—that will render them nearly obsolete. Over the past several update cycles, Apple owners have been lulled into a false sense of security. 3G stuff worked for 3GS. 4 worked for 4S. Aside from a change in case design, it's tempting to assume that these iPhone side dishes are blessed with ageless compatibility. The reality is they're six weeks away from being worthless..
That's right. The new iPhone's most drastic change is expected to be its dock connector shrinking down to a 19-pin port from 30 pins. (Ugh). 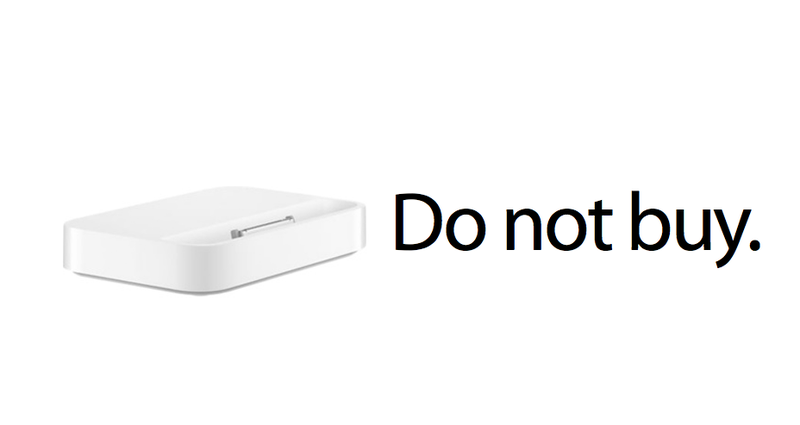 As 9to5 Mac points out, you're about to see a ton of 30-pin dock connector fire sales. But don't be fooled! Typically spendy docks are all going to be offered on the cheap, but next month none of this stuff will work with your shiny new iPhone and its skinnier port. Even if you don't plan on picking up a new iPhone this fall, it's important to think long term. If and when Apple goes to a smaller port, it's never going back. So unless you either buy docks with shocking frequency or don't plan on ever updating your phone again, you should hold off. That is, unless you're okay with buying a crappy 30-pin to 19-pin adapter that you'll end up losing in a month. While we're at it, it's wise to avoid buying iPhone cases, too. While we don't know exactly what the new iPhone is going to look, but it's almost certainly going to be a different size and shape. If you literally just bought an iPhone 4 or 4S and plan to hold onto it for a couple of years, sure, knock yourself out. But if you have any interest in upgrading ever, stand down. Waiting is hard, but hold off for the next month and a half or so, because right now you'd just be burning money on something disguised as a deal. If you're exercising restraint, it's best to just wait on buying anything for your iPhone, period. Cables, chargers, adapters, etc.—these things aren't going to work with Apple's next-gen smartphone. And though the price might be right, ignore, ignore, ignore. Your future self will thank you.